Comp-Tac has a wide variety of concealed carry inside the waistband holsters. All Kydex IWB holsters, leather/ kydex hybrid holsters, tuckable iwb holsters and easy-on-easy-off holsters are available for over 169 different makes and models including Glock, 1911, S&W and many, many more. Please visit their website for full information on each holster. The MTAC is an inside the waistband Kydex and leather hybrid holster designed for concealed carry. 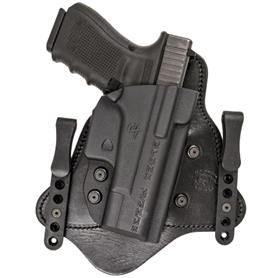 Created to be worn behind the hip at 4:00 or 5:00, this holster offers the best in comfort and speed for concealed carry use. The MTAC’s top grain cow hide leather backing is the most comfortable material to wear against your skin. It provides a soft flexible material that does not rub or pinch. The Kydex body on the MTAC provides a rigid material that is custom fit to each firearm and maintains its shape even with the pistol un-holstered. The smooth, low friction surface allows for a fast draw and easy one-handed re-holstering of the firearm. The all-Kydex body will not bend or stretch over time and is impervious to sweat and solvents.